Pin It Now! I was so pumped last night after I had separate homeschool pep talks with my 3 kids! We addressed some issues that had cropped up towards the end of last year, I let them each know what was expected of them this year, and I really encouraged them to be grateful for all that God has blessed us with, to work hard, and do it all for God's glory. Even though they were a bit bummed about school starting again, as they usually are, we were all in great moods last night and everyone was ready to have an awesome day today. Three out of four of us were cheerful, but one let stinkin' thinkin' get the best of him. And it started BEFORE school even began. Yep, picture time. I do it every year on the first day as I am sure most of us silly mamas do. But the attitude started then, and I knew my day was not going to turn out like I had hoped. Just pray, pray, and pray some more, I told myself. Just last night I had prayed that I would truly be filled with the Holy Spirit and would be a good teacher and mom for the glory of God etc. Though this certain attitude was bringing 3 of us down and causing distraction, I was determined to not let it get the best of me with Christ's strength, not mine, of course. I also took the opportunity to speak frankly with the child bound by a negative attitude. Such is life, though. I shouldn't be surprised by obstacles. I must learn to live with them and not let them ruin my day. It can be very challenging, however, day-in and day-out. I know I will fail, but not today. For the sake of getting the year off to a good start, setting a good example to my family, and for bringing glory to my God, the day has been redeemed. My daughter's memory verse this week happens to be "Let us not become weary in doing good, for at the proper time we will reap a harvest if we do not give up." (Galatians 6:9) I totally needed to hear that. I have wanted to give up the whole homeschooling thing OFTEN. But I know I am called to do it, and as a friend once told me, "He doesn't call the equipped, He equips the called." So, now that we have that out of the way, on to the first day pics . . .
We made it through the first day, yea! And now I need to go grade all those papers. Ugh! 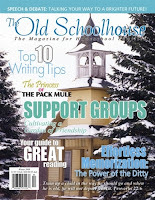 I was thrilled when The Schoolhouse Review Crew was given the opportunity to review a subscription to SchoolhouseTeachers.com. It's a site (from The Old Schoolhouse® Magazine) that offers on-line lessons and activities in a variety of subjects for children in preschool through highschool. Content is updated monthly and sometimes even weekly and is available around the clock. I had heard so many good things about this site but had never actually checked it out for myself. On my first visit, I took the Site Tour and watched 2 brief videos that helped me understand what's offered and and how to best use the site. Even though there is a lot of information on the site, it is organized and super easy to navigate! I definitely recommend familiarizing yourself via the Site Tour before diving in. 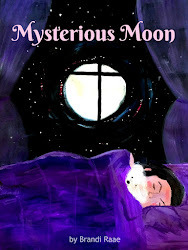 The little arrow on my screen was naturally drawn to Literature since reading and reading aloud to my kids are a couple of my absolute favorite things to do! Adam Andrews, Director of the Center for Literary Education, is your online Schoolhouse Literature teacher. Currently, you can access lessons from March 2012 - July 2012. 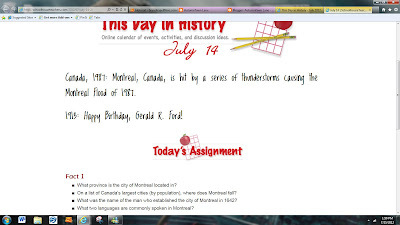 I was pleasantly surprised when I clicked on June's lesson as it was all about The Hobbit! My oldest and I have already read it, but I'd been talking about reading it aloud before the movie comes out in December. Perfect timing! So, I've been spending the summer reading The Hobbit to my three kids and discussing it with the help of the downloadable, 22-page lesson plan. Essay questions and story charts can also be downloaded. A red oval, just like the one pictured above, is featured on each subject's main page. It's very helpful to be able to see a quick summary of what your child will be learning for that particular course. Some of these subjects group assignments according to grade level: K-2, 3-6, and 7-12, which comes in handy when homeschooling more than one child. We've been using This Day in History to get our intellectual juices flowing in the morning. 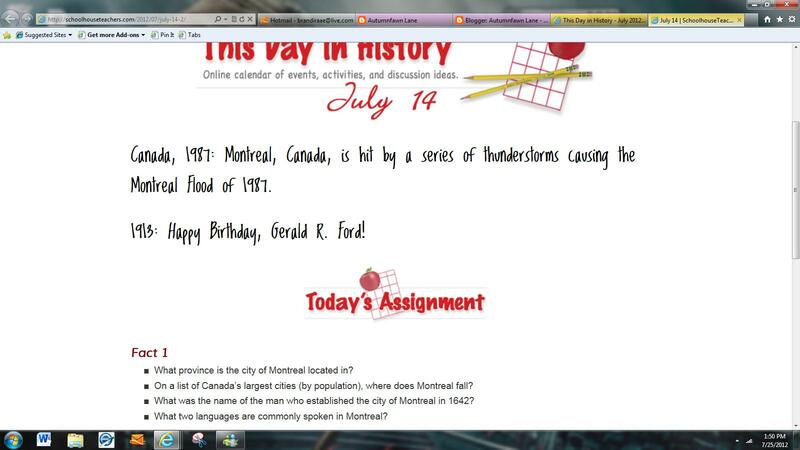 It's neat to learn about significant events that happened in the past on each day of the month. We've just been doing the research together as a family in the morning, but there are many different printables available to further your child's study as well. With your SchoolhouseTeachers.com subscription, you have access to The Old Schoolhouse® Magazines delivered to your e-mail inbox. You can get issues dating all the way back to 2007! It was nice receiving a short ice cream unit study via email from The Old Schoolhouse®. My kids and I had fun learning all about it and then going out and getting some! Also, you can download a free TOS E-book every month. This month's book is called, Turning Points in Homeschooling. In this book, you will meet homeschooling families who have reached their own turning points, and you will also be inspired to seek and trust God to influence all of your decisions. I like reading about what other homeschool families are doing - it's encouraging to know you are not alone! As a member, you have access to all of the Schoolhouse Planners. There are 5 in all ($125 value! ): the Schoolhouse Planner, Schoolhouse Special Learners Planner, Schoolhouse Primary Planner, Schoolhouse Intermediate Planner, and Schoolhouse High School Planner. If you are still trying to decide if a Schoolhouse Teacher's membership will meet your needs, you can view sample lessons here. 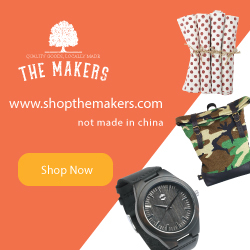 You might be wondering if this site will cover most or all of your curriculum needs or you may just want something for extra curricular subjects. Take a moment to peruse sample lessons for writing, history, math, music, and more to see if it's a good fit for your family. You can become a Schoolhouse Teacher's member for just $5.95 per month. Join now and pay only $1 for your first month. You also have the option of purchasing a year's membership all at once for $64.26 -- a 10% savings. Such a fantastic deal for all that's offered! 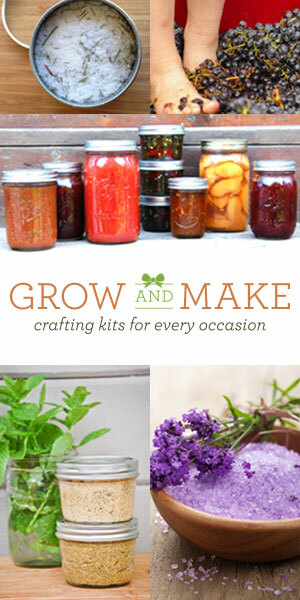 For me, this is proving to be a great site which fills in some of the gaps in my homeschool. Art, music, and technology -- to name a few -- are not exactly my strengths. Also, I have never followed a strict literature program (I love freedom in this area), so I know I will continue to incorporate some of these lessons into our schedule. I like that learning with Schoolhouse Teachers continues in the summer, too. Already this site has kept me pretty busy, and I look forward to discovering so much more in the coming months. Check out what other Crew Members had to say about SchoolhouseTeachers.com here. Pin It Now! Super Duper® Publications specializes in fun learning materials for kids. Their colorful catalog boasts over 250 pages of products and games pertaining to listening skills, inferencing, early skills, social skills, and much more. It even has a section devoted to autism. 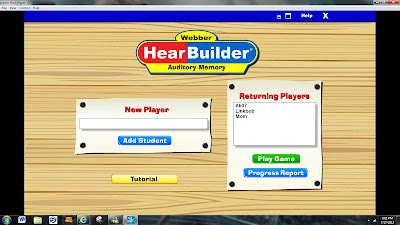 Our family reviewed HearBuilder® Auditory Memory Home Edition. It's an interactive software program that helps children sharpen their memory skills. Kids will join top secret Recall Agents, Joey and Kim, on a secret mission as they try to protect Memory Town from Dr. Forgetsit and his wacky schemes. Each activity or mission has multiple levels of difficulty, which means that children must master simple memory tasks before moving on to more complext ones. 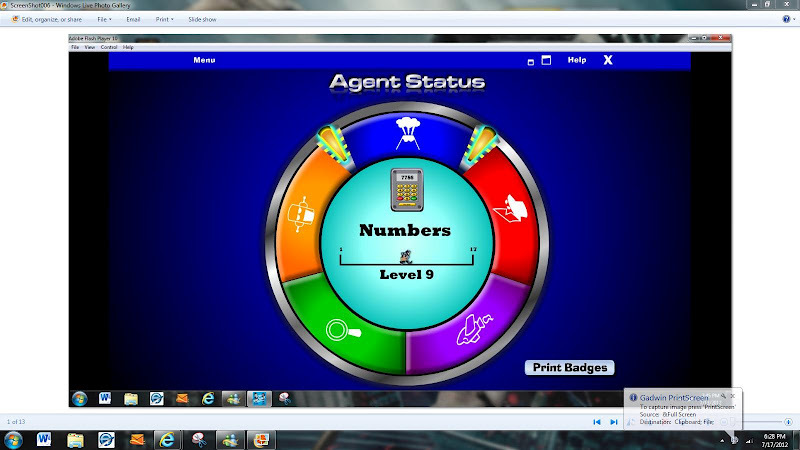 Reward games appear after the completion of a level in each activity and badges can be earned for each completed mission. HearBuilder® Auditory Memory is a snap to install and is compatible with Windows® or Macintosh®. You can check full system requirements here. This program runs almost entirely from your CD-ROM drive. However, because it stores records on your hard drive, children who are using the program should play on the same computer to continue saving data each time they play. Getting started is easy. You simply type in child's name under New Player then click Play Game. 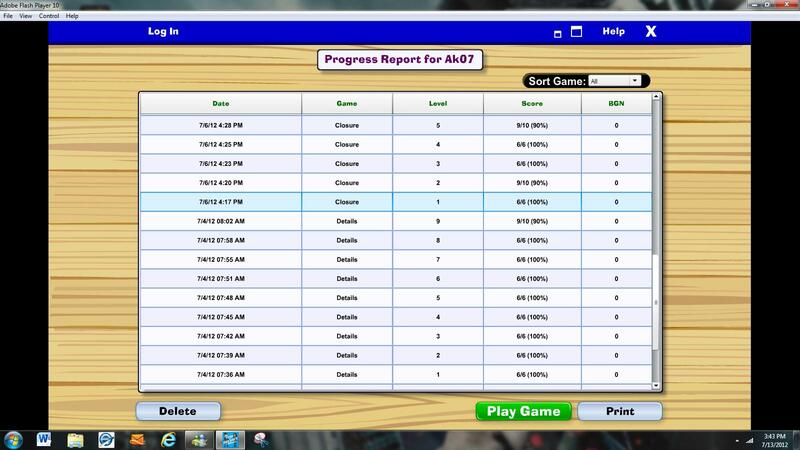 Each time your child plays after the initial set up, you can choose his/her name from the Returning Players list. Next, you will choose a play setting (listed above under Home Edition Features). I chose All Levels for my two children who used this program. Children must demonstrate 80% accuracy to move on to the next level of play. If your child needs extra practice listening with competing noise, choose Expert level. I let my children choose which activities they wanted to do each day, and after 30 minutes of play hard work, they earned candy. 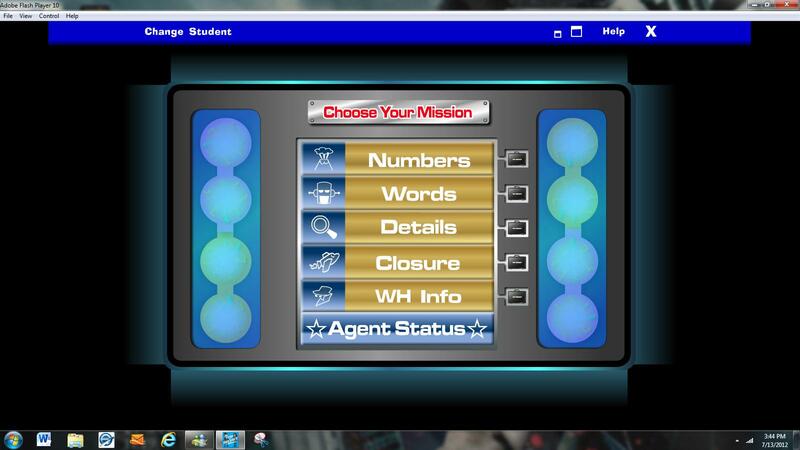 Notice the briefcase to the right of each mission -- they contain memory strategies for each of the activities. The strategies will automatically appear if your children miss three or more items in a set of ten, but you can click on them at any time for helpful hints. The Agent Status button at the bottom of the screen serves as a way to gauge progression for each activity. Badges can be printed here as well. Each mission is explained in detail in the instruction booklet included with the CD-ROM. There's also 30 minutes of video on YouTube explaining exactly how this program works. To try out some of the activities for yourself click here. Headphones are recommended when using HearBuilder®. 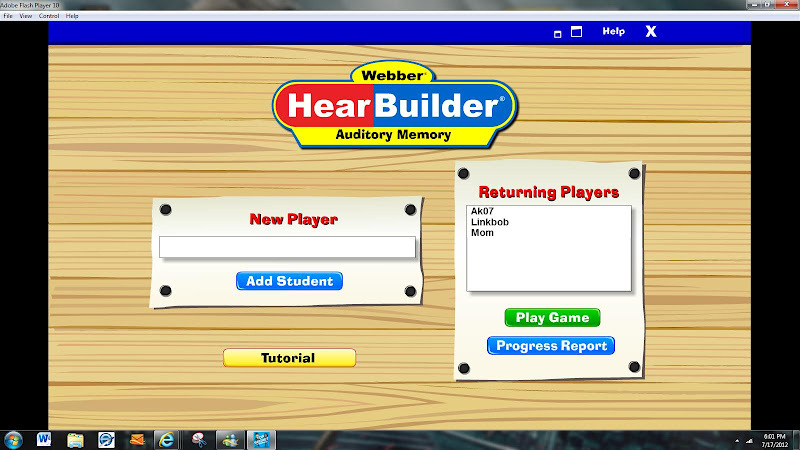 My 7 year old daughter really enjoys learning with HearBuilder® Auditory Memory. It's challenging and fun at the same time. I love that she can play on her own. My middle son, who is 10, thought the whole secret mission theme was too kid-ish for him. The learning activities themselves weren't, though. 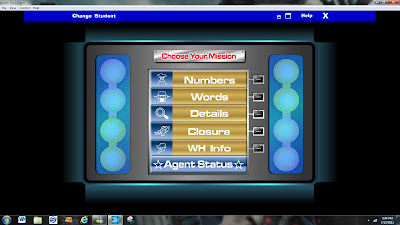 He even mentioned how difficult the Numbers mission was as he advanced levels. My almost 13 year old son really wasn't interested in trying it out. For us, this program made a great summer time activity. I would recommend it as a fun and educational way for your children, especially younger ones, to improve their listening skills. 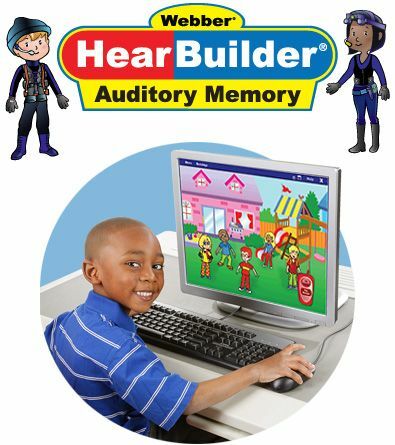 You can order HearBuilder® Auditory Memory Home Edition for $69.95 on the website. Order between now and the end of August and receive 30% off! See what other Crew Members had to say about Super Duper Publications! Pin It Now! I know they're just dishes, but to me they are treasures. My mom, my kids (minus my sick Mullin), and I enjoyed our visit with grandpa. I love that he's lived in the same house longer than I've been alive I think! You don't hear of that very often nowadays! My kids surely won't be able to say that about our home. My oldest is already living in his fourth house. My how times have changed. Thank you grandpa for the sweet fellowship, the countless stories, the yummy pizza, and for telling me I look like Cindy Crawford every time I see you. :) (Yeah, minus the mole, a whole bunch of money, and SO much more! Add pale skin, a smattering of freckles, a frumpy belly, and there you have it - just like Cindy!) Makes me chuckle every time. Bless his heart. In her award-winning E-book, Keyboarding for the Christian School Elementary Version, Leanne Beitel, with the help of Miss Mabel the ladybug, teaches the basics of learning the keyboard. Leanne incorporates God's Word in her lessons, so while young children are learning to type, they are also soaking up God's Word and hopefully hiding it in their hearts! First, Leanne introduces children to QWERTY keyboard and offers 12 helpful touch typing techniques such as sitting up straight, keeping feet flat on the floor, and keeping elbows naturally at your side. Next, she moves right on to the lessons - 32 in all. Lessons are brief since this program is targeted toward children in grades K-5. Once children's hands are correctly positioned, they are ready to begin. I chose to keep both of the documents - Keyboarding for the Christian School and Word - side by side on the computer screen instead of printing out the lessons on paper. Lessons 1-29 basically follow the same simple format in which children will usually learn 2 keys per lesson. Alphabetic keys, numbers and symbol keys, and number pad will be taught in these lessons. Each lesson begins with a Bible verse and brief instruction as to which fingers to use for typing the keys being taught. They will practice the keys for that lesson by typing lines, and all lessons after the first one will include a review section. Children will complete 5 sections (A, B, C, D, and E) in most lessons. In lesson 5 children will learn the G and H keys. E. Practice the new keys with the previous lessons. Type each line two times each. Press Enter once after each line. Press Enter twice after each set of two lines. This will leave one blank line after each set. Children will begin typing their first set of words in lesson 6, which is also a review lesson. Sentences will come later and they will all be Bible verses. In lesson 30 centering is taught, and in lesson 31enumerated lists are taught. Children will type three different Psalms and a list on how to have a relationship with God during these 2 lessons. Lesson 32 offers timed writing and isn't meant to be saved for last. You will want to check this lesson out before your child/ren begin this program so you will know when to insert timed writing. I almost forgot and had to back track just a little. Starting after lesson 6, timed writings are every other lesson. I tried having my daughter, who recently finished first grade, do the lessons, but I don't think she is ready for them just yet. She did complete two of the lessons and would've probably continued to do them, but I felt it was taking her too long. I didn't want her becoming frustrated, so I am going to wait for another 6 months to a year to restart them. For my son who is going into 8th grade, this was just a refresher. For children 6th grade and up, I would recommend the other one, Keyboarding for the Christian School, which was also reviewed by the Schoolhouse Review Crew. Be sure to click the link below for more information. I didn't take my first typing class until I was in highschool, but these days with kids being exposed to computers before they've even given up sippy cups, it's really essential that keyboarding is learned before highschool. 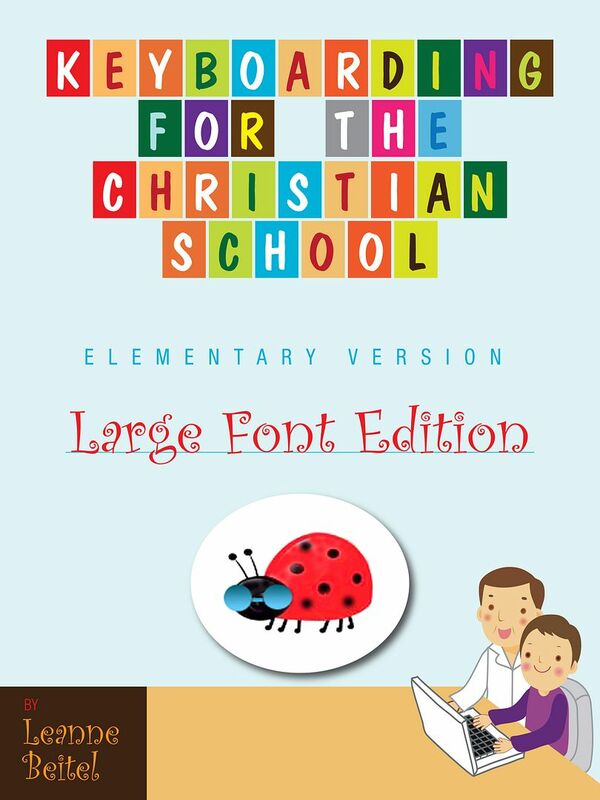 If you have elementary aged children who use computers, I think you should consider checking out Keyboarding for the Christian School Elementary Version. You will be glad to know that it won't break the bank either! You can download the E-book version for just $12.95. A large-print version is also available for the same price. For those who would like a hard copy instead, $45 covers the book, shipping, and handling. For a short time please enjoy this coupon code for 20% off of your purchase - SUMMER2012. Expiration: 8-29-2012. See what other Crew Members are saying about Keyboarding for the Christian School here. Since we love smoothies so much (my kids tell me I need to open up a smoothie shop - so sweet), I decided to come up with a smoothie made from our very own apples . . .
Pin It Now! As far as rentals go, my hubby really scored big when he found this treasure in a sea of not-so-nice properties. It's on a tree-lined street which is hard to come by in regular AZ desert neighborhoods, and my boys get their own rooms - Woo Hoo!!!! Our house in the heart of Queen Creek, and living in a real town means I won't have to pay to use the library. :) Kind of excited about that! Our street lined with real, green trees. In the spring, they are covered in yellow flowers. I still need to adjust to this way smaller backyard, but at least it has a covered porch which we didn't have before. No house behind us either. Still getting used to the backyard not feeling as private as my other one, but the view isn't too bad. On the other side, we can see a mountain. And now for the inside - the living room (obviously). Entryway and little off-to-the-side sitting room, I guess. Upstairs has a loft. Yea! A place to store homeschool stuff. No longer does it have to be a part of my kitchen decor. Our homeschool hutch broke, but my mom found this cabinet for free. I'd love to eventually have a cool, vintage-looking bookshelf, but for now this is great. I was beginning to go a little crazy with books all over the floor! My boys are thrilled to have their very own space - Mullin's room. And one last room that I LOVE having - a real laundry room!!!! Upstairs and out of the way. Like! Overall, it is a great house. I got a little worried at first when late night trains passing by woke me up, but now I mostly sleep through the noise. :) Not one scorpion has been seen either, praise the Lord!!! !